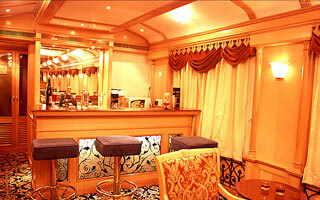 The perfect touch of delicacy and royalty can be seen in every detailing of Deccan Odyssey. The state-of-the-art amenities available onboard this royal Indian train makes every day a unique experience for the travelers. Facilities onboard Deccan Odyssey covers an array of services that include regal class cabins, multi-cuisines restaurants, sitting lounge, high-tech conference car and a rejuvenating health spa. The signature of utmost comfort and pampering treatment, Deccan Odyssey facilities make you feel special even in the crowd. . Since its initiation, this luxury Indian train has refurbished its facilities and services from time to time so that every time a better experience can be shared with the travelers. The introduction of more high-tech amenities in the later period contributed towards making the journey more and more alluring. A tour to Maharashtra on the rolling iron wheel was never as exciting and mesmerizing as after the introduction of Deccan Odyssey India. 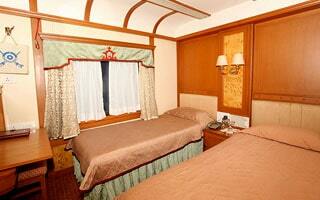 For your kind perusal, the following are the summarized description of the facilities onboard Deccan Odyssey. Echoing the penchant of the erstwhile Maharajas, all the 12 guest accommodation coaches of Deccan Odyssey is outfitted with cozy furniture and personalized guest amenities. Complemented by the very best of personal services, travelling on the private cabins of this deluxe rail is a unique rail tour experience in India. When you travel in these elegant class cabins of the train, you can feel that the inside décor reflects several moods to suit the outside views of the landscape. All the cabins are spacious enough where guests can roam freely. The decoration of each coach reflects a particular era of the Deccan milieu and is creatively outfitted with facilities like personal safe, telephone, attached bathroom, air-conditioning and a personal attendant on the round the clock service of the guests. The Deccan Odyssey has two multi-cuisine restaurants- Peshwa I & Peshwa II. The brilliantly decorated interiors of these restaurants add on more flavors to each gourmet dish served by the restaurant stewards in traditional Maharashtrian attire. The large selection of Indian, oriental and continental delicacies offer the travelers the freedom to choose their favorite one from the list. The fresh aroma of varied dishes welcome the guests to the restaurant cart of Deccan Odyssey. The relaxed ambience of the restaurants, the fragile hospitality of the stewards and the ever changing views of the outside world make the guests savor each bite of their food to its fullest extent. The onsite bar of Deccan Odyssey, Mumbai Hi, is the ultimate place to taste some of the best varieties of wines and spirits collected from all around the world. Along with that the bar also serves non-alcoholic beverages in a relaxing ambience. The decoration of the bar is simple yet elegant that exhausts the entire day fatigue of the excursion tours to different forts and palaces. 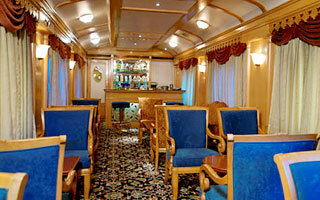 Unwind and relax in Mumbai Hi of Deccan Odyssey with a fine glass of wine in your hand. Though the royal rail journey with Deccan Odyssey will never make you feel bore, but the train also has a sitting lounge where guests can relax and chat with their fellow travelers while on the go. You can also pick up a book available in this lounge and take a deep plunge into the writings of the eminent authors. Keeping in view the travelling requirements of the corporate voyagers, a conference car has also been provided onboard Deccan Odyssey India. This particular conference car is fully equipped with high-tech amenities and audio-visual equipments required for a successful business venture. To take care of all the corporate endeavors, the train also offers hospitality services crafted according to the needs of the traveler. 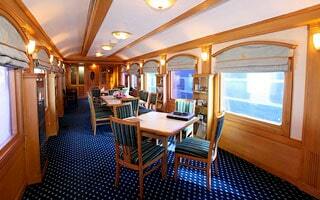 Every voyager expects their traveling days to be relaxing and in Deccan Odyssey we understand this need quite well. The health spa center onboard gives the voyagers a chance to discover the refreshing side of your personality and appearance with pampering spa and massage therapies. From the treasure trove of ancient Indian science Ayurveda, the secrets of rejuvenations have been used so that the entire jaunt can be turned into a regenerating experience for the travelers. Get ready for an experience of a lifetime, planning a journey into the world of luxury train travel with Deccan Odyssey. 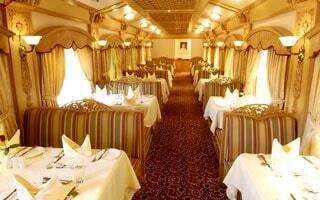 The decor recreates the golden days of the Maharajas traveled with opulence in ostentatious carriages. The journey also immerses travelers in the spirit of the era with sightseeing, pampering hospitality, lavish dinners, gin and tonic sundowners, elephant rides and delightful cultural performances.